If you are a skier (or snowboarder) the chances are you have at least thought of booking one of the many ski holidays on offer in the Three Valleys (or Trois Vallees if we're speaking French) but what's it like to ski there. This mecca of European skiing is a worldwide destination for anyone who loves skiing holidays and with 14 separate ski resorts, over 350 chalets, a huge selection of excellent quality hotels and some of the highest skiing in Europe it's not hard to understand why. In fact, the Three Valleys holds the title of the World's largest linked ski area meaning you can get everywhere by lifts or on your skis – no buses required! With over 600km of slopes and over 200 lifts, ski holidays in The Three Valleys also offer some of the best quality skiing, as well as the largest interlinked ski area, in the world. As the name suggests the 14 separate ski resorts in the area are spread out across three separate valleys, all of which linked by lifts and slopes. The most famous of the resorts is Courchevel 1850 which is home to some of the most expensive hotels and chalets in the Alps. This is the place to be seen (Prince William recently took his family here) if you are wealthy, famous, exceedingly wealthy, or all three. If your holiday budget isn’t quite up to these dizzy heights then Courchevel Moriond (1650) provides some fantastic family skiing and accommodation at more reasonable prices. The lower-lying Courchevel resorts of Courchevel Village (1550) and Courchevel Le Praz (1300) also offer some excellent value accommodation in both chalets and hotels. Also in the Courchevel valley, is the car-free and family friendly resort of La Tania which is a perfect resort for children to learn to ski. The middle of the Three Valleys is home to Meribel – a resort that was first discovered and developed by a Brit and which still attracts thousands of British skiers every year. 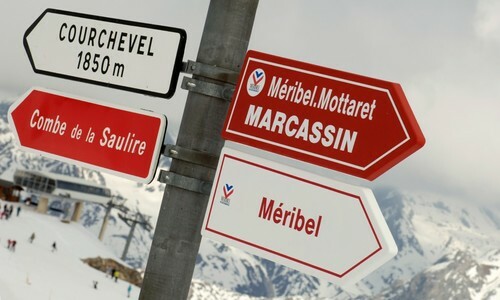 There are several villages in the Meribel valley: Meribel, Meribel Mottaret, Meribel Village and Meribel Les Allues. The benefit of being in the middle of the Three Valleys is that it’s easy to access all three of the valleys – you just need to choose which way to ski in the morning! With nearly 150 chalets in the Meribel valley you can see why it is such a popular resort with the British. The third and western most valley is home to Val Thorens, the highest ski resort in Europe with a ski season that runs right through to May. Most accommodation here is ski in and ski out which makes it great for beginners and family groups who don’t want a long walk to the slopes. Also in the Val Thorens valley are the slightly lower lying resorts of Reberty and Les Menuires (which are perfect for families) and the picture-perfect village resort of St Martin de Belleville. Reberty: Attached to Les Menuires but situated higher and built with a much more sympathetic chalet style architecture. Getting to the Three Valleys from the UK is easy enough. The closest airport is Chambery which is about 90 minutes away. Geneva, Lyon and Grenoble all have transfer times of 2.5 – 3.0 hours. If you’re lucky enough to hire a private plane or helicopter, you can fly into Courchevel or Meribel altiports. The Three Valleys are also within easy driving distance of Calais so those who don’t like to fly or travel light can get there within 9 hours. Read more on driving to the Alps. Moutiers train station is within 30 - 40 minutes’ drive of all the ski resorts within the Three Valleys. Both Eurostar (day and night trains) as well as French TGV trains from Paris stop at Moutiers station which means that ski holidays by train to the Three Valleys are very do-able. For non-skiers the Three Valleys area offers plenty of activities to do away from the slopes. From classic ski resort activities such as tobogganing and horse drawn sleighs to more extreme options such as hot air ballooning, snow mobile rides and helicopter tours of the area. You definitely won’t be bored! Courchevel Village (1550) has a genuinely exciting toboggan run - best navigated when totally sober. The Aquamotion Centre in Courchevel Moriond (1650) is one of the best waterparks in the Alps. With 11 pools, water slides, wild rivers and a wave surf zone (all heated to 32 degrees) as well as a wellness area with sauna and steam room the whole family will be entertained. The Olympic Park in Meribel is a sports and relaxation complex which includes a swimming pool, an ice rink, a spa and a fitness area. The resorts within the Three Valleys are some of the most developed ski resorts in the Alps. The larger resorts in the area all have excellent infrastructure and facilities which includes a fantastic collection of ski schools. The ESF (Ecole Ski Français) is the ubiquitous state run ski school. With the growth of independent ski schools the ESF has had to up its game which it has done admirably in the Three Valleys area. Its ski instructors and childcare are just as good as with the smaller independent ski schools but being French you must expect French children in the classes and sometimes French used as the first language in the lessons. Some clients like this international flavour but others do not. Of the independent ski schools aimed squarely at the British market new Generation, Magic Ski School, BASS and Parallel Lines are the best. The Three Valleys offers high altitude, snow sure skiing in each of the valleys so there is rarely an issue as when to travel. There is always access to the highest skiing in the Courchevel valley to the east and the Val Thorens valley to the west. The middle Meribel valley also has access to its own high mountain, Mont Vallon, which has fantastic north facing slopes that start from a height of 2,952 metres. Although height of the ski slopes has a lot of influence on the depth and quality of the snow cover (particularly important at either the beginning or end of the winter season) slope aspect also has a major role to play. This is why the north facing slopes of the Courchevel valley allow perfectly good early and late season skiing, even down to the lower lying resorts of La Tania (1,350m) and Courchevel Le Praz (1,300m), whereas the west facing slopes leading down to Meribel (1,400m) are unreliable, especially at the end of the season when the full force of the sun can turn the home piste returning from Courchevel into a slush pit. Another myth, created for the most part by the way the piste map has been drawn, is that St Martin de Belleville is a very low resort and should be avoided in December or April. In fact the resort height for St Martin, at 1,400 metres, is exactly the same as for Meribel. There is no reason therefore to write off a stay here in either early or late season especially as the new high speed gondola lift from the village centre allows you to easily download from the mid station. If you are skiing in the Three Valleys in either early December or late April then it pays to stay at one of the more snow-sure resorts in the area. If budget will allow then Courchevel 1850 works fine. Mottaret in the Meribel valley and either Les Menuires, Reberty or Val Thorens in the western most valley are the choice picks to guarantee the best snow conditions. Whichever resort you choose a ski holiday in the Three Valleys will never disappoint. The ski area is simply too large and too varied for even the best skier to get bored. In fact clients return year after year to explore new parts of this huge ski domain.